Deb's guest today is Author Teresa Ives Lilly. Along with a couple of questions, we're highlighting two Christmas novellas! So, Teresa... What's the biggest challenge to you when working on a story? Teresa: Finding Time. I can only write between 9pm and midnight and I'm often tired at that time. But, the day hours are spent taking care of my precious five-year-old grandson. What would be your ideal Christmas vacation if you won one for your family and or friends? Teresa: To Colorado in a cabin with all my kids and grandson. What is your favorite setting and era to write in? Teresa: I used to write mostly historical but I now prefer to write contemporary. I’m enjoying writing stories like Back in His Arms, my most recent contemporary. Deb: And, I see that Back in His Arms is set in Colorado. That's a great way to make writing a 'mini-virtual-vacation! What are you working on now? Teresa: I'm writing a mystery to go along with my Harbor Inn, Maine series. It’s really a challenge for me as I’m used to writing romance. Deb: Yes, as a mystery writer (when possible), I know that plotting it out--and I don't know anyone can write a mystery without plotting--is a challenge! Thanks so much for visiting with us, Teresa! Ready for some Christmas Cheer? Paris has come to the Lodge at Confluence to work as the event’s coordinator for the Christmas season and fulfill her desire to see the beautiful state of Colorado. The last thing she expected to find was her high school sweet heart Paul Gordon, the only man she ever truly loved hosting a realtors convention at the Lodge. Will the Lodge’s reputation of being the Hotel of Love (Hotel L’Amore) stand true, when Paris finds herself back in Paul’s arms again? A Christmas Masquerade is a heartwarming and inspirational story. Set in the early 20's, a couple from different backgrounds (one wealthy and one poor) are thrown together when they find a sick child. Ryan becomes close to the family and sees in them what he has missed within his own family. Deanna whose father is ill accepts the responsibility for the family and works to help support them. Can a masquerade help them overcome their different backgrounds and bond them together in love? Deanna and Ryan are working together to care for an ill child, but they come from two different worlds. 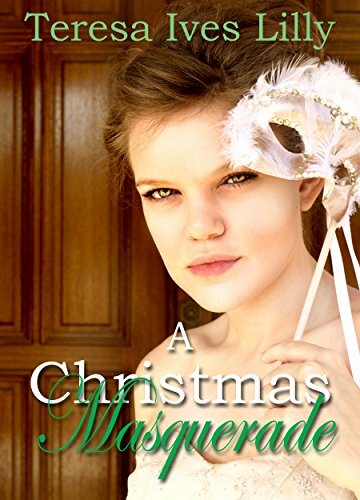 Will a Christmas Masquerade be able to bring them together? Thanks for visiting with us, Teresa!